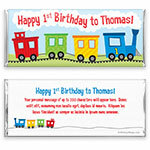 A bright, happy train adorns this charming birthday candy bar wrapper. Design: Brightly coloured train on tracks with smoke cloud. 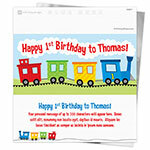 Personalization: Front message, number on train engine, back title and message.